Go to ground or stay big…? To better understand when to go to ground and when to stay big and narrow the angle. Within a distance of 4-6 yards from the goalkeeper depending on the age and skill set of the goalkeepers involved. 2 grids with a 2-yard channel between the two grids. Recommended grid size: 4 x 4 yards or 4 (width) x 6 (length) for advanced goalkeepers. The size of the grid can vary based on the age and skill set of the goalkeepers involved. 1 Goalkeeper starts in the channel facing the Coach/Server (orange). The goalkeepers needs to be in such a set position that they can go either left or right depending on the direction of the service. If more than 3 gk’s involved the extra gk is waiting “on deck” to come in. 2 goalkeepers (labeled F for forward) need to be on the end lines between the two cones. It is important that these two remain between the two cones. If they start inside or outside the grid they will either increase or decrease the grid size and skew the exercise parameters. Restrictions are that the two “forwards” have to take two touches, not one and not three but always two. Play begins with the Server playing a ball to either forward. The ball speed can be varied from easy to difficult to handle, playing harder balls can make the drill more functional as they are harder to settle for a second touch. The forward attempts to settle the ball with the first touch and then attempts to “score” with the second touch. To score, the forward needs to play the ball past the gk and through the channel. The Goalkeeper reacts to the direction of the serve and then has to determine if (based on the forwards first touch) they should go to ground (1v1 save) or step into the grid, narrow the angle and stay big. If the forward scores, the goalkeeper stays until they make a save. All players involved reset and the server plays another ball. If the goalkeeper saves the ball, they replace the forward they saved and a new goalkeeper comes in and the forward joins the “on deck” group. I call this exercise “The Distance of Death”. Why… Because I believe that the distance of 4-6 yards from the goalkeeper poses the question of “should I stay or should I go?” And it’s with this one question that goalkeepers can either make the game winning save or give up the game-winning goal. 2. Distance of the touch of the attacker. Controlled or Uncontrolled? One of the reasons that I refer to the 4-6 yard distance as “The Distance of Death” is because many times the goalkeeper, especially younger goalkeepers, have a hard time determining what is a controlled/uncontrolled touch and how distance form the goalkeeper helps determine if a touch is controlled vs uncontrolled. If a attacker is 10 yards from the goalkeeper and takes a 2 yard touch… The goalkeeper would in most instances narrow the angle, stay big and prepare for the shot, not go running out and go to ground. But now that same 2-yard touch at 6 yards from the goalkeeper becomes a bit more difficult to judge. Should you go and go to ground or should you narrow angle, stay big and react? This is the question I hope to solve with this training exercise. Also, I talk to my goalkeepers about recognizing what is a controlled/uncontrolled touch and how it determines if the goalkeeper can be controlled (narrow angle/stay big) or uncontrolled (go to ground). If the attacker has a controlled touch, meaning that they are able to play the ball quickly with a second touch, the goalkeeper in most instances needs to be matched up and be controlled (narrow angle/stay big). The same concept is true if the attacker takes and uncontrolled touch, meaning that their touch gets away from them and they are not able to play quickly with that second touch, the goalkeeper can be uncontrolled (go to ground). I often remind the goalkeeper that if they are not matched up with the attacker, meaning if the attacker has control but the goalkeeper is uncontrolled (going to ground or still moving) it will not often workout in the goalkeepers favor. The attacker in this instance would most likely dribble the goalkeeper or take the shot while the goalkeeper is still moving. Conversely, if the attacker takes a wayward touch (uncontrolled) and the goalkeeper fails to react and stays (controlled), it may allow the attacker the opportunity to regain possession and attempt another try on goal. 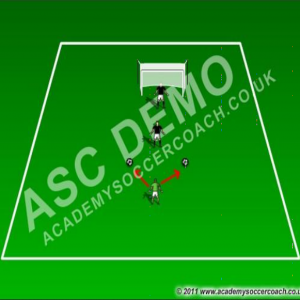 This drill allows the goalkeeper the opportunity to recognize and react to situations in a learning environment, where they can make and learn from mistakes. This also allows the goalkeeper and the coach to assess the goalkeepers’ abilities in relation to technique, reaction speed and the willingness to go to ground.